If you follow me on Facebook, you might have already heard the news, but I wanted to share it with everyone who reads the blog, as well. The news being that I’ve officially selected a narrator for the Murder in “Utopia,, audio book which should be releasing some time in late March or early May–as long as everything sticks to schedule, of course. I’m producing the novel through Amazon’s ACX which connects independent authors with independent producers, and the entire process turned out to be rather simple and straight forward. If any of you readers are authors yourselves and you have questions about the process, feel free to ask them here and I’ll answer to the best of my ability. So if you’re as excited to hear the audio book as I am, sign up for my email newsletter through this link and stay up to date on the release of the Murder in “Utopia,, audio book, and if you can’t wait that long, just pick up an eBook copy of the novella through this link. Thanks for your time, dear readers. Happy Thursday. Have a good one. Rating: Four stars out of five. This is a fascinating example of fiction that’s more of an experience than a story. I’m not going to list it among my all-time favorites, but I’m definitely glad I read it. Perkins took some admirable risks with this book and made a concerted effort to cut against the grain, and that kind of thing can often end in utter disaster. Murder in “Utopia,, defies many conventions of storytelling and formatting, but it manages to do so without becoming incomprehensible. It’s confusing, but that confusion is grounded by a conversational tone, a well-drawn setting, and an absurd, morbid splash of humor. I definitely recommend it to anyone who wants to take a bit more of a cerebral adventure than your average piece of genre fiction has to offer. So if that sounds like something you’d enjoy reading, pick up a copy of the novella for only two dollars through this link today. Thanks for your time, and happy Tuesday. Another Saturday comes and still no new chapters to post for Infinite Limits. Sorry, dear readers. But I do have the print proof now so I can say for sure that next Saturday will mark the return of the Infinite Limits universe to this blog with the first chapter in book two, An Almost Tangent. In the meantime, I took some time this morning to write an author’s note for my absurd novella Murder in “Utopia,, which you can purchase (or read for free if you have kindle unlimited or Amazon prime) through this link. Here’s that author’s note to give you a better idea of what’s going on in the novella, and don’t forget to sign up for my email newsletter, with updates on new releases and offers for free books, right through here. For this novella my main goal was to produce a work that was at the same time absurdist and decidedly literary. I think I’ve succeeded in both aspects. Murder in “Utopia,, was written without the use of quotation marks to distinguish dialogue from narration, much like you would find in a Cormac McCarthy novel. I however, unlike McCarthy who uses the same format for all his works, only wanted to forgo the use of quotation marks if it was for a purpose in the story that went beyond stylistic preferences. With Murder in “Utopia,, I found that purpose. The story takes place almost entirely inside a priest’s confessional office. Chapters alternate between a psychiatrist giving her confessions to the priest and the confessions of the very patients mentioned by the psychiatrist in her sessions. Every sentence that is written in the past tense is spoken aloud to the priest or by her, and every sentence that is written in the present tense is one of the priest’s thoughts or an action she experiences. I think you can see now why I found the quotation marks to be unnecessary, even without my having to spoil the plot-based reasoning found in the final chapter of the novella. I think you can also see why Murder in “Utopia,, may be a difficult read the first time through. There are no quotation marks to set off dialogue, the tense of the writing changes based on whether the words are spoken or experienced, and to top it all off, no names are mentioned for any of the characters, each being referred to only by their occupation or the pronouns her, she, etc. But fear not, dear readers. Continue on despite your confusion. Confusion is part of the experience. And by the end, I think you may realize that you’ve found more clarity than you thought possible in such a jumbled, messy “utopia”. Thanks for reading along. I hope you enjoy the work and join me for more stories in the future. Today’s the day, dear readers. Head on over to Amazon to purchase the absurd novella Murder in “Utopia,, for only two dollars. Or if you have Amazon Prime or Kindle Unlimited you can read the book free. Either way, take a look and let me know what you think. Who am I tomorrow, then? How can I be both? What’s up, y’all? 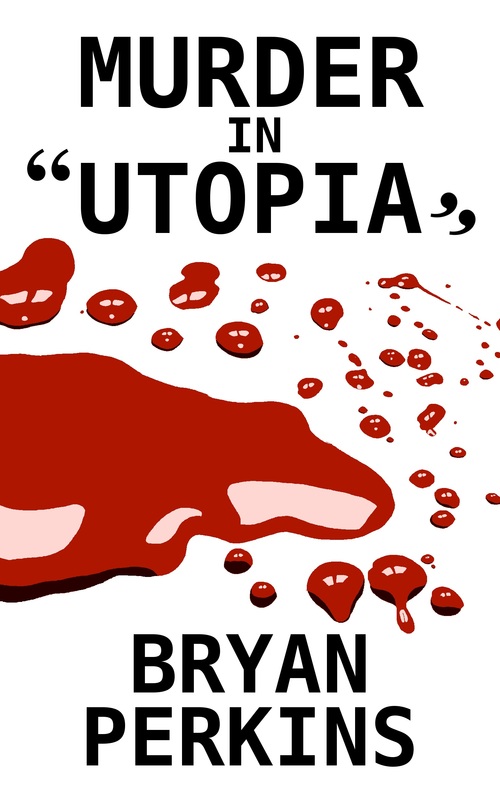 Today I’m happy to announce that a novella I’ve been working on for some time now (Murder in “Utopia,,) is up for pre-sale on Amazon, available this coming Sunday, October 4th. Now, I know, I know. That’s a pretty short pre-sale time limit, but I just wanted to give a little time for everyone to hear the news and put their two dollars in so we can have a big group of them sold all at the same time on release day. That way I’ll get higher up in the Amazon rankings and I’ll be seen by a wider audience. So please, think about reserving your copy of this absurd first person novella about a priest and a psychiatrist living in utopia who discuss with each other their confessors and patients, a list of people that includes a surprising number of murderers for such a “utopian” society. Thanks for your time. Have a great day.